They will walk you through everything. Just read the instructions and answer questions. Even before you have perfect words in there, go ahead and verify your listing to get the ball rolling. It can take a few weeks before it will show up. You can edit later. Be sure to complete the verification process or the listing will never show up. After you find it showing up online, send your public link to some of your happy customers and invite them to leave a review in there. That will help improve your rank in Google. For increased effectiveness, include good photos in your listing. For ideas on optimizing your listing, see Google’s tips for creating a great listing. 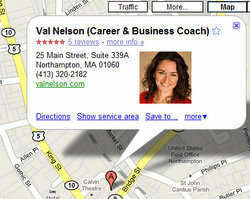 After I added myself to Google’s listings, I became one of the top results in Google when someone searches for a coach in my local area. I immediately noticed receiving more inquiries and I continue to get leads from Google. For free. It’s easy to be a big fish in a small pond so start local, even if you want a broader audience. Make this is a top priority if you want more business. Fast, free, effective — the best kind of marketing task. When you’re ready for more visibility, the next best place to be found online for your business is LinkedIn. See LinkedIn Profile Essentials. Originally published on January 13, 2010. Last revised on September 5, 2017. Posted in Confident Self-employment, Heart-Centered Marketing, Web & Social Media | Tagged marketing, SEO tips | Bookmark the permalink.